We have returned to Vilnius to continue research at the Great Synagogue site. The trip over was long, but uneventful. I left from Pittsburgh, and went to Newark, then Amsterdam and then on to Vilnius. The flight into Vilnius was on a cramped prop plane. I was glad when we landed and was even more glad to see my equipment bag arrived. Air Baltic flight 610 is below. 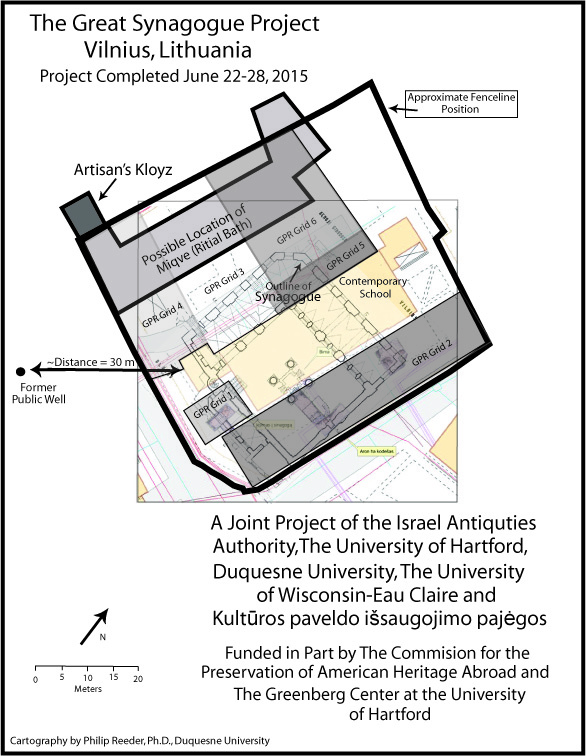 Below is an ERT image that depicts a cross-sectional transect across the buried ruins of the synagogue. Precisely, this transect crosses the mikveh, the ritual bath behind the synagogue.This is the excavation target for this year. The two darker color areas are of particular interest, especially the one on the right that is over four meters in length. An archaeological square that is 2.5 meters wide and ten meters long was placed on the land surface above this anomaly. This is the excavation one hour after the corners were laid out, surveyed in for the map and digging had begun. You can already see what appears to be a toppled wall in the closet part of the excavation. This is the excavation on day two. Other features are starting to become better defined. The anomaly that appeared in the ERT is under where Dr. Richard Freund is standing. It is about one additional meter below the surface. We hope that it is exposed sometime tomorrow (June 22) so we can see what feature is precisely causing the anomaly. Also of note is the fact that the research is being filmed for a PBS documentary for the show NOVA. Kurt Wolfinger, who we worked with at the Cave of Letters in Israel and who was the producer/director for the documentary “Ancient Refuge in the Holyland” that was shot during that project, is again the producer/director for a film about our work at the Great Synagogue of Vilnius” and other sites in and around the city. Below is the film crew getting set up for some preliminary shots related to the opening of the first archaeological square. Tomorrow (Wednesday June 22) marks a second phase of the project for me, in that we will begin mapping in Ponary Forest which was the site of the Ponary Massacre which occurred from July 1941 and August 1944. Upwards of 100,000 Jews were murdered at the is place which is near Paneriai, now a suburb of Vilnius. January 11th – We arrived at the office of the Archaeology Commission on Rhodes at about 9 AM for a meeting with the Greek officials to pick up our research permit. Part of this meeting also involved laying future groundwork for additional studies we want to complete in Rhodes in the future. The meetings lasted two hours and we left the meeting with our permits and a plan for the completion of our research design over the next week. We still needed to complete GPR analysis at Kahal Shalom. 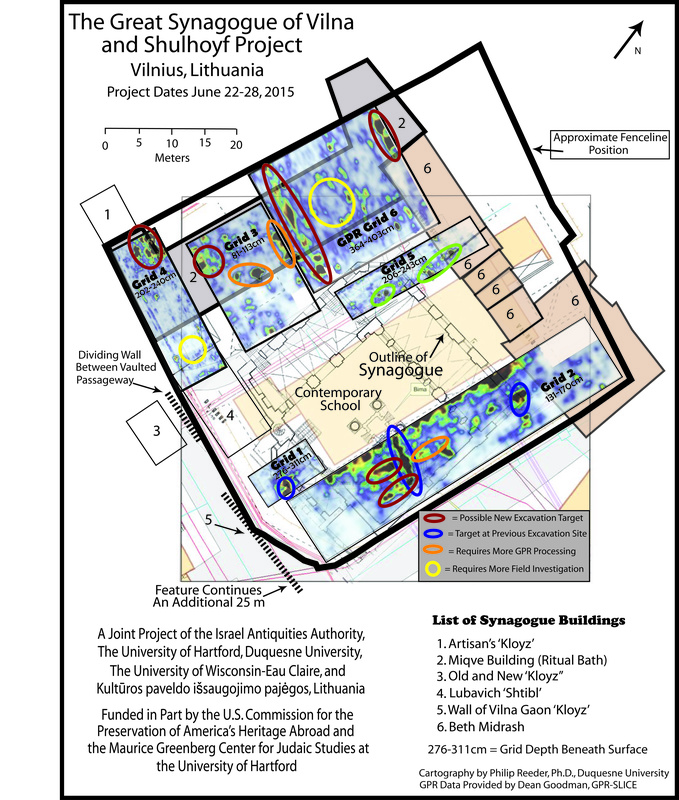 Last year the GPR transects covered about half of the floor area in the main synagogue building. This year’s plan was to complete the analysis of the other half of the synagogue building, and to collect data from the courtyard outside the main synagogue building. My part of this work included merging this year’s spatial data base with last year’s data base. We are also to complete additional work at the Grand Masters Palace. At the Grand Masters we completed a set of GPR transects in the open area outside of the main palace walls. This year we will continue that set of transects across this open area right up to the walls of the Grand Master. Additionally, we will complete a set of transects behind the palace in an area where a Byzantine era tower existed. Finding the Byzantine walls and towers are important in the search for Hellenistic era features. The Byzantine features pre-date the Hellenistic features by about 700 years, but it is very likely that the newer Byzantine features followed the trend of the older Hellenistic features. We have located Byzantine era walls that were exposed at the surface by past excavation and in the existing walls of the Grand Master Palace. In some locations the Byzantine walls form the base of the Grand Master walls. The GPR also located anomalies in the open area outside of the Palace walls that are interpreted to be Byzantine walls. Another area where work will be completed is Kahal Grande. Like Kahal Shalom, the GPR line at Kahal Grande only covered about 50% of the exposed floor of the old synagogue. The plan for this year was to complete the other 50% and to then lay out a set of transects perpendicular to the other transect, hence forming a grid. Collecting GPR data from a grid allows the data to be modeled in three-dimensions. Lastly, we were to continue to collect GPR and spatial data at the Church of the Victory. Last year we collected GPR data from one set of transects and this data did not indicate any anomalies in the subsurface. The plan this year is to collected data from different transects in the vicinity of the ruined church and to collected data from two GPR grids as well. After the meetings with the commission we went to the Grand Masters Palace to continue the GPR transect from last year. Last year we were able to locate a sizable length of what we suspect is the Byzantine era wall several meters beneath the open area at the palace. The map created last year is presented below which shows the Byzantine wall. We are scheduled to have a dinner meeting with the city architect and his wife tonight. His wife wrote her doctoral dissertation on locating the Colossus and the plan is for her to meet us tomorrow to show use where she thinks the base of the Colossus is located now under the palace. January 12th – We spent the morning at Kahal Grande. The first part of the research design at Kahal Grande involves completing the second 50% of the set of transects from January 2015. This involved collecting the spatial data to allow the map of Kaha Grande to be updated. Also, locations for eventual fiberscope analysis were located. These are locations where a fiberscope can be inserted to possibly see any structural materials beneath the current floor. The data collected today showed an anomaly located beneath a unique tile pattern on the floor. In future days before our departure on January 17th, a hole may be drilled in the vicinity of this feature so that an possible structures beneath this location can be possibly viewed. Shown below is the updated map of the Kahal Grande with the fiberscope locations noted, the expanded transect lines and GPR grid added and the unique floor design placed in the proper location. Also presented below is a photo of the unique floor design under which the anomaly is located. 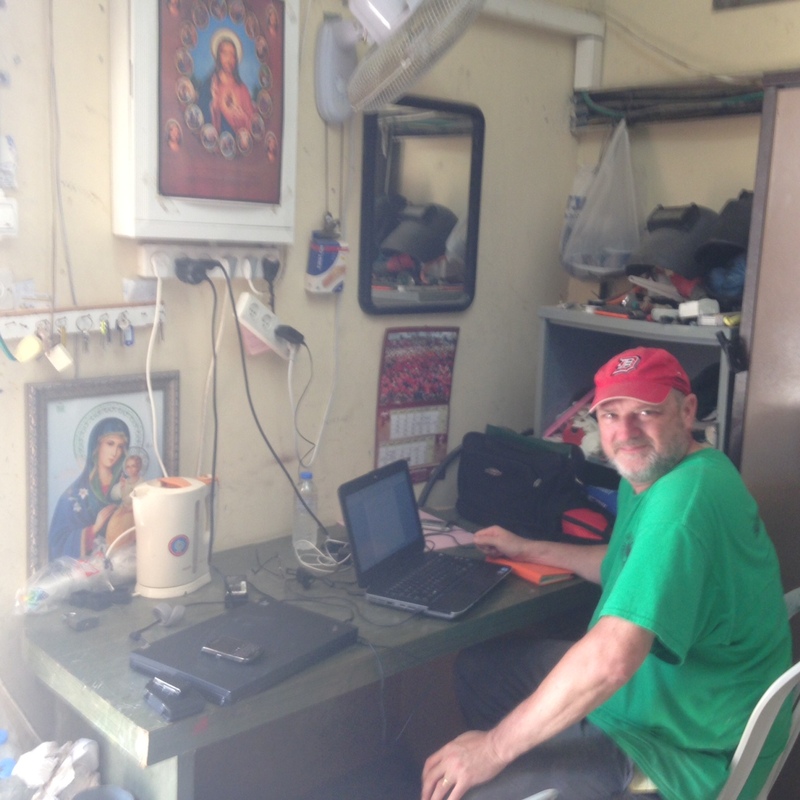 January 13th – Today we started work in the morning at the Church of the Victory. When we met with the town architect on Monday night he indicated several locations at the ruins of the church where he thought walls of the older Jewish synagogue located beneath the ruins of the Church of the Victory could be found. Additional transect lines were laid out and GPR grids were created in two locations. The updated map of the Church of the Victory is presented below. The GPR data from these locations is still being analyzed and I will add it to the blog later in the week when the data is ready. In the afternoon we went back to the Grand Masters Palace to complete GPR analysis in the vicinity of where a Byzantine tower was possibly located. As previously noted, the Grand Masters Place in places used the old Byzantine walls as the base of new walls for the palace. Such a location is depicted below. It is hypothesized that this Byzantine wall was the base of the Byzantine tower. It is further hypothesized that the Byzantine tower was built at the location where the Colossus of Rhodes once stood. Below is a photograph of GPR data being collected in the vicinity of Byzantine tower location at the Grand Master Palace. I heard an interesting story while collecting spatial data at this location today. Below is a photo of Richard Freund standing next to a very large rock. This rock was collected from the sea floor in the harbor. In the late 1980’s a psychic said that she could see the hand of Colossus at the harbor. Dredging eventually found this rock. The grooves in the rock were said to be the fingers of the Colossus. The rock was hauled to the Grand Masters Palace for display. Eventually, study by geologists and historians refuted that the rock had anything to do with Colossus, and the story was essential forgotten and the rock is now tucked away in a storage area of the palace grounds. January 14th – The morning was well spent at two locations. First, I met with one of the archaeologists. I was given access to five bags of bones that were collected on the south end of Rhodes Island at an early Christian burial site. I randomly selected a total of 15 bones from the five bags. These bones will be transported back to Duquesne University and they will be preliminary analyzed in the DNA Analysis Lab. It will be determined first if there is extractable DNA and the if yes, the DNA will be analyzed. These preliminary analyses may serve as a preliminary step in the development of a much larger project in cooperation with the Greek Archaeology Commission. The purpose of this project will be to develop a ancient DNA data base for the island of Rhodes. Depicted below are five bones collected from one of the bags. In the afternoon the research team received a guided tour of the Archaeology Museum of Rhodes. The museum possesses a fantastic collection of artifacts spanning the long history of the island. January 15th – The morning was spent at two locations. First we spent time visiting the XRF team that is working at Archaeology Commission laboratory for the past four days. They are working on a project using the XRF to scan each artifact in the collection of oil lamps that the commission possesses. The XRF quantifies the type and percentage of each mineral that makes up the artifacts. In this way each mineral is quantified and comparisons can then be made between artifacts and time periods to uncover information about changes in mineral composition through time and perhaps ancient trade practices. The team working on this part of the research design for this project has been so efficient that they have completed the collection of oil lamps and have moved on to other vessels. Depicted below is a fantastic vessel. This is a Bronze Age pot, most likely used to store oil that is from 2,400 BC. It was collected intact, as shown in the photo. This is a magnificent piece of history. Also depicted below is the XRF team in action. At this point they have scanned and photographed over 150 artifacts. Our goal was 125, so we are very pleased with how this segment of the project is going. As an aside, there is a photograph below of Dr. Harry Jol in one of the archive rooms of the Archaeological Commission. As you can see, they still store a lot of this data in paper form. The afternoon was spent back at Kahal Shalom shooting GPR in the back courtyard at the synagogue. Several holes were also drilled in the floor at the locations of GPR anomalies and the fiberscope was used to view is the holes intersected any underlying structures. In this case nothing could be seen. Wednesday January 6th and Thursday January 7th – The journey to Rhodes began with a 7 AM pickup for the Pittsburgh Airport. The flight schedule to Rhodes was pretty involved. I went from Pittsburgh to Dulles Airport in Washington DC, to Munich, Germany, to Thessaloniki, Greece and then on to Rhodes. The total travel time once I left Pittsburgh was 22-hours. We landed in Rhodes at 3:15 PM on Thursday January 7th. It was a pretty uneventful trip until the Thessaloniki to Rhodes leg. A severe weather system settled over Rhodes and the landing in driving rain and strong winds was interesting to say the least. The gusts were upwards of 50 miles per hour and the sheets of rain were being blown completely horizontal. We picked up the rented 9-passengar van and were off to the hotel. Last January we stayed at the Savoy Hotel which was right in the middle of the new part of the city, so essentially we were right downtown. This year we are staying at the Semiaris City Hotel very near the famed beaches of Rhodes. Rhodes is the most popular summer tourist destination in Europe. Since it is winter now, most of the businesses and hotels are closed and the city is not deserted, but only about 5% of the populations that will be present in summer are present in winter. Below is a shot of one of the better known beaches, deserted now because of winter. The weather, besides the rain has been pleasant, with daytime temperatures around 60 degrees F and 52 degrees F at night. Friday January 8th – Below is a link to the proposal related to what we hope to accomplish during our seven work days on Rhodes. Today we will continue work we completed last year at Kahal Shalom Synagogue. We completed GPR in the main building of the synagogue last year. We were able to complete about 50% of the area and one of the goals for this year is to complete to other 50%. Pictured below are some of the student technicians that are assisting us with the project. They spent an hour in the morning being trained on how to collect GPR data and jumped right into it after that collecting real-time data for the project. The students are from Stockton University (New Jersey), the University of Wisconsin-Eau Claire, and Clark University (Massachusetts). Like last year, the data sets that are collected are emailed to Dean Goodman at GPR Slice, a private company in Los Angeles that reduces and manipulates GPR data. About 24-hours later, the plots created from the data sets are emailed back to us so we can see what the GPR has revealed beneath the present-day floor. The version of the Kahal Shalom Synagogue we are working in now was rebuilt after World War II. It was not destroyed in the war by allied bombing, but it was greatly damaged. The theory we are working under is that the precursor to this present-day structure was from 1854. That version of Kahal Shalom was partially or totally destroyed by a large earthquake in 1854. The pre-1854 version probably dates back to 1710, when it is theorized a 1710 earthquake destroyed or damaged that version of Kahal Shalom. The Kahal Shalom Synagogue was founded on this site in 1577, so the pre-1710 version probably dated to that time. Any building that was on the site of the 1577 synagogue, prior to its construction, was probably destroyed in a 1480 earthquake. Our hope is that GPR will point out some of these underlying levels with a high degree of confidence, and that future excavations will reveal these features. Another component of the research design is XRF analysis. This x-ray fluorescence analysis differentiates the mineral content in some natural materials. In this case we are using it to determine the mineral content of pottery samples. The data will show similarities and differences in the source materials for the pottery and hence changes in the source materials over time. Pictured below is a student from the University of Wisconsin-Eau Claire using the instrument to analyze pottery shards collected at the old Jewish Cemetery just outside of the walls of the old city. These were analyzed as a dry run for the real intended purpose for the instrument, to analyze the source materials and mineral content for 125 oil lamps now housed in the collection of the Rhodes Archaeological Commission. The analysis of these samples will mark the beginning of what we hope will be a comprehensive data base for the mineral signature of oil lamps in this part of the Mediterranean. January 9th – Was a Saturday and hence Shabbat for the Jewish members of the team. As has been the case for the many years we have worked together on research projects around the world, we do not work on Saturdays. Some of the team went on a tour of some of the sites of interest around the island. I caught up on sleep and took a long walk (four hours plus) in the afternoon. In the evening we went to a special dinner for our group sponsored by the President of the Rhodes Jewish Community Association. It was a wonderful five course meal at a restaurant/hotel owned by the association’s president. Everything about it was great, accept it did not end until after 11:30 PM, way past our normal bedtime. I did not fall asleep until after 1 AM. January 10th – It is Sunday morning and the Old City is very quiet. We slept in a bit because of the late night and did not get up until 7 AM. We are once again working at Kahal Shalom. On Friday we collected GPR data using the 250 mhz antennae which give a decent resolution, and today the data will be collected in the same area using the 450 mhz antennae which will provide much higher resolution and hence more detail of the features underlying the current floor of the synagogue. 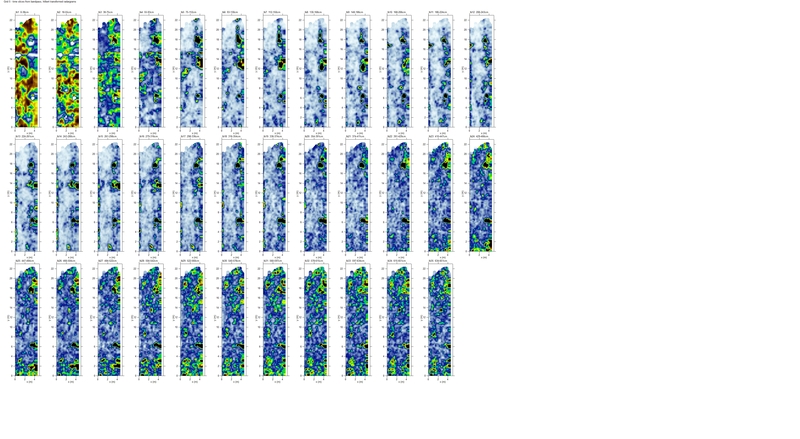 Also, overnight, the data plots arrived via email from Dean at GPR Slice. They are included below. The first two are all the slices of data. 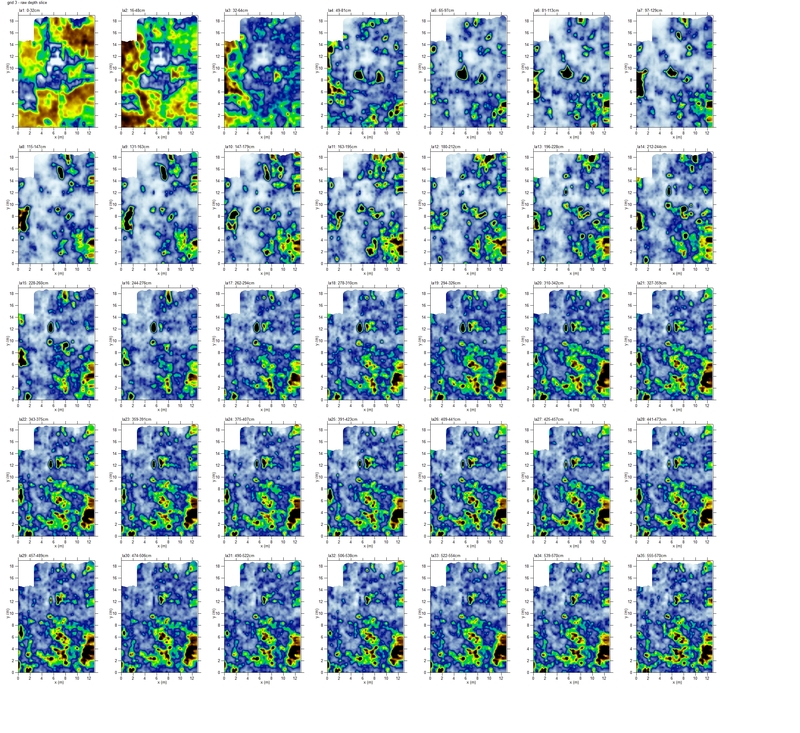 In the upper left as you look at the plot you are looking at the near surface materials. As you move to the right you are looking progressively deeper. 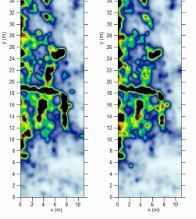 There are several features in these plots that stand out as possible anomalies and hence structures that might exist beneath the current floor. To get even a better representation of what might be below the floor a 3-D plot was created. That is included below. Although the data is arranged in 3-D, because it is being displayed on a computer screen, it only appears in 2-D. Even though it is in 2-D, the subsurface features still clearly standout. The other plot that is included is a composite plot. In this case the software removes all the noise and interference and accentuates what it interprets as the good signals. In this plot, the darker areas may represent features that are under the floor. Lastly for today, we are thinking about one of our sub-projects for later in the week. We are still waiting for permission, but we hope to do some exploratory reconnaissance near the Rhodes Acropolis. The reason for this exploration is to finds sites for eventual data collection to answer the question: Where was the Colossus of Rhodes actually located? There are three current theories. One states that it was in the vicinity of the acropolis; one states that it was at the port; and one states that it was located at what is now the site of the Grand Masters Palace. We hope to begin to collect some data regarding the location of the base of the Colossus. The statue itself, which stood about 100 feet tall and was covered with bronze, was destroyed centuries ago, but it is theorized that the base remains behind, somewhere in the vicinity of the Old City of Rhodes. The photo below shows the top of the Acropolis of Rhodes. In closing, an article appeared in the local newspaper on Rhodes about our return and our new program of research. It was of course written in Greek. We are having it translated and when ready I will add it to the blog. That’s all for now. I am on the road again. 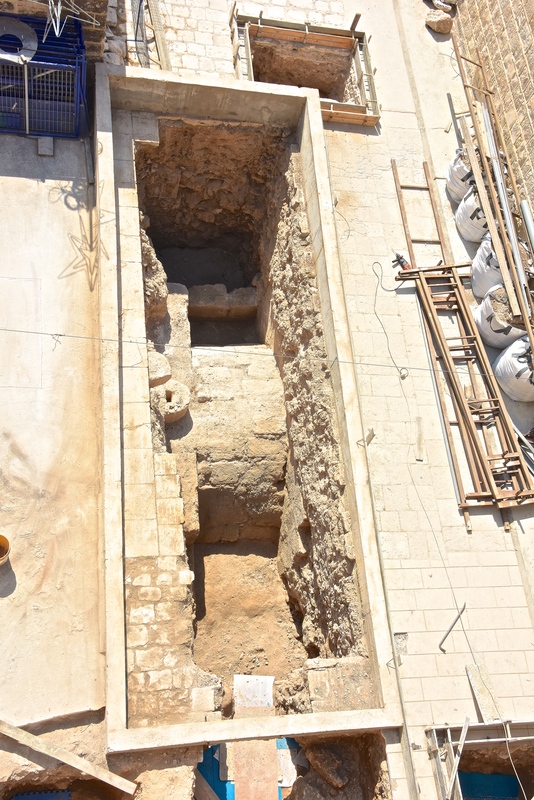 With the success of the dig at the Greek Orthodox Church of the Annunciation in Nazareth in June, the church wanted to continue the excavations in August. The dig was reopened on July 22nd. My services were required to complete detailed maps and diagrams for this very important excavation. It is envisioned as a minimum five year project that will have a set of yearly maps and diagrams which is invaluable as we track the progress of the research through time. What follows is a summary of what brought us to this point with regard to the recent occurrences of the project. Right now we are driving at 7:30 am from where we are staying at Nof Ginosar on the Sea of Galilee, to Nazareth where the church is located. It is about a 45 minute drive. It is Monday August 10th. I departed Pittsburgh on Wednesday August 5th on the 6:20 pm flight to Philly. I met up with Richard Freund in the Philly airport and we then flew to Tel a viv. The flight was just over ten hours. We landed at 3 pm local time on August 7th, cleared immigration and customs and rented a car for the drive up to the Galilee. The drive from the airport to Nof Ginosar was about three hours. After a quick dinner it was off to bed for a few hours sleep. The workday was scheduled to start at 6 am the next morning. Friday August 7th: Up at 6:00 am, breakfast at 6:30, then the drive to Nazareth. We arrived at the church at 8 am. The first task at hand was an assessment of what had been done up to that point. The archaeological squares that were opened in June 2015 were designated A trough E, hence there were five. 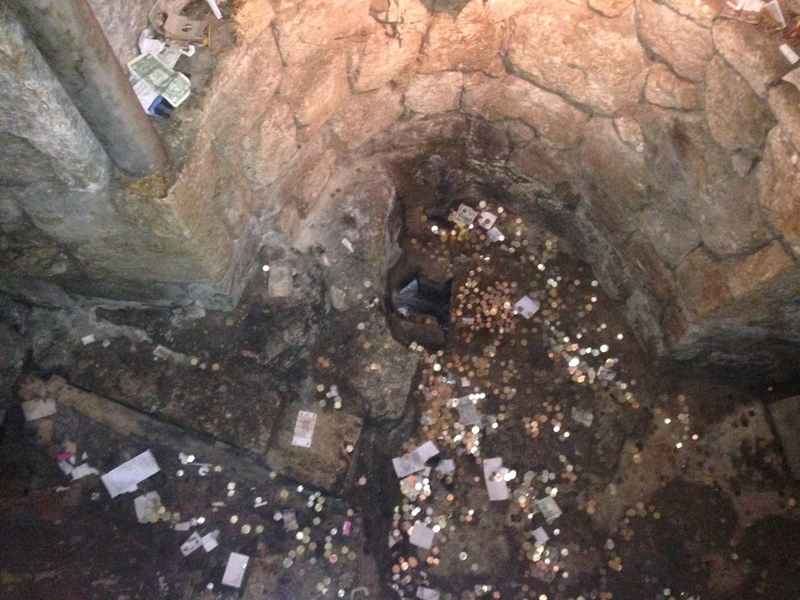 These had already been covered with glass viewing ports so that visitors to the church could view the finds. The large illegal excavation that took place at the site in the 1980’s was cleaned out by the archaeologists and was covered with glass as well. Below is a photo of that site before being enclosed. This photo was taken from the roof of the church. What you can see in this photo are two areas of importance. First the curved barrel shaped feature in the center. This is actually the top of the vaulted hallway that exists deep inside the church at the lowest level that leads to the holy water source at the very back, north extreme of the church. The water at this location is the same that our previous research proved was the water found in the spring and cave north of the church and that most likely flowed from the church to the Public Mary’s well and the nearby ancient bathhouse where we previously worked. Below are photos of the vaulted hallway and the spring in the church. Depicted below are the areas of the excavation now covered by the glass enclosures. There are also three other squares that were opened for excavation. These are F, G and H. I will discuss these shortly. In terms of data collection, on Friday August 7th I collected the primary spatial data I needed to construct the map of the area behind the church. Using the total station I collected orientation, distance and elevation data from 60 stations that were established at important points behind the church. Below is my data book depicting all my field notes and the collected data. Looks like gibberish right? I can actually make sense of it, really, and construct detailed plan view maps and cross-sections from this data. When they are complete, hopefully in a few weeks, I will add them to the blog. We finished at about 5:30 on Friday because of the Jewish day of rest, Shabbat, which begins on Friday at sunset and ends on Saturday at sunset. Although I am not Jewish, I generally observe the day of rest concept when working in Israel. I used Saturday to catch up on my rest after all the travel and lack of sleep to get hear (I don’t sleep on planes), and to organize the spatial data for eventual map production. Sunday August 9, 2015. We had the same routine as Friday. Get up at 6 am, breakfast at 6:30, departure at 7:15 and arrival in Nazareth at 8:00 am. 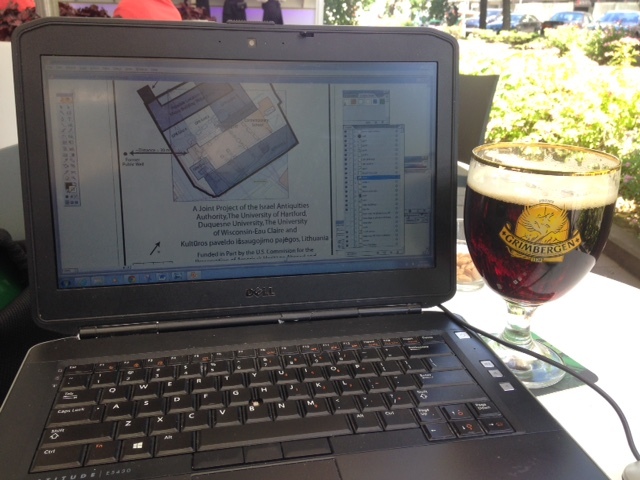 I spent most of Sunday collecting detailed spatial data from the areas that were excavated in June. This data will allow me to create very detailed plots of the excavations that can become part of many of the maps produced for the project. Although it was Sunday, I did not directly attend mass, but heard the whole Greek Orthodox mass that was going on in the church just a few feet from me. In my book I was near enough to get some spiritual fulfillment even though I was not actually in the church. By the way, the mass was in Greek, which I do not speak, but I did recognize some parts of the mass, I think. It last well over two hours. On Sunday, after collecting needed data from excavations A, B, C, D and E, as well as the previous, large, illegal excavation, I turned my sights to the most recent excavations (F, G and H), which were still active, and thus have not yet been covered by glass. I drew detailed diagrams of excavations H and then F. Again, these can be used to provide specific details for these excavations which can add more specificity to the maps. H is a small test pit which is only partially completed. F is a 4.0m x 3.5 m excavation that reveals some walls from what is postulated to be the Byzantine era church, the one that is speculated to have contained the mosaic floor. 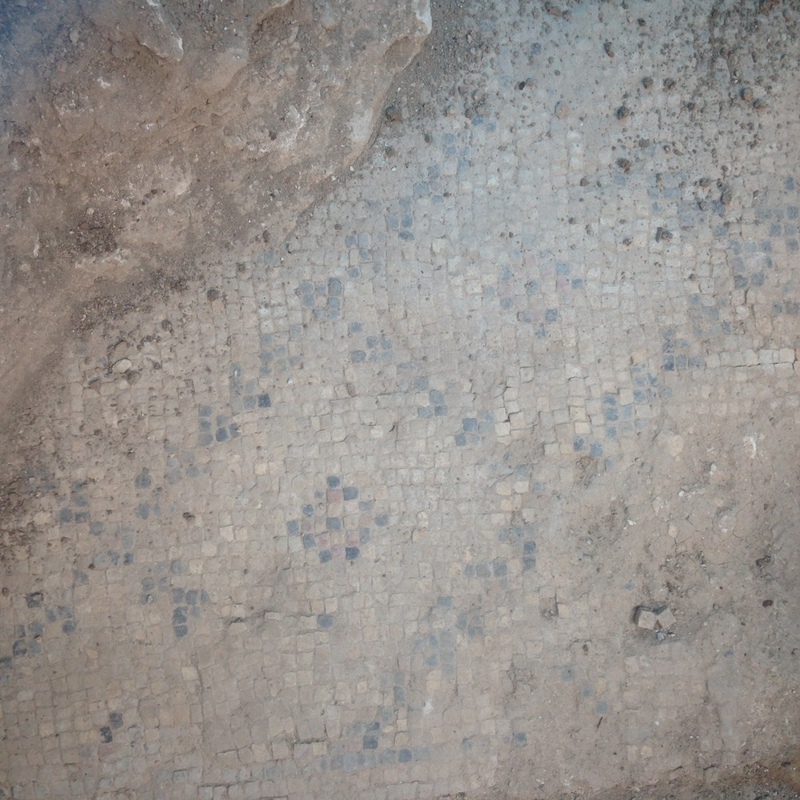 Below is a photo of the mosaic floor that was uncovered in excavation A. It is the largest exposure of the floor. There is a photo of a cleaned area of the floor earlier in this blog. This one is much “dirtier” because it was covered with a layer of sediment to help protect the floor. Sections of the mosaic floor can also be seen in excavation C and in excavation G.
Monday August 10, 2015. I have written the entries for the blog from August 5th, my departure from Pittsburgh, to today (it is now 12:38 pm) in my little field office at the site. It is actually a storeroom. See the photo below. Notice the walls. A rendering of the Byzantine Mary and Jesus, Jesus and the Stations of the Cross, and a calendar from the school adjacent to the church, are my constant companions. Today I completed data collection from excavation G, so that a detailed plot of that area can be added to the more general area maps, and I also collected data for the completion of cross-sectional profiles of excavations F and G. Below is a photograph of excavation G. Notice the wall in the center of the photo. This, according to the archaeologists, is from the Byzantine era, and most likely correlates with the original fourth century church. That’s it for now about Nazareth. We hope to finish the remaining data collection today Monday August 10th). Tomorrow, we have several meetings with local officials, and will need to pack up all the equipment for an 11:35 pm departure from Tel a Viv. Jon Seligman, from the Israel Antiquities Authority stopped by the site to discuss our other ongoing project, the Great Synagogue of Vilnius Project that we worked on in June, 2015. This project has been garnering a lot of attention and plans are underway to have a second field season in summer 2016. For my part, I have been continually updating the map from Vilnius. The newest version is below. Also, we have been contacted by several national media organizations that want to make a documentary about the research we will complete in summer 2016. I will pass on more information when I know more. Below is the press release for the discoveries at Nazareth and Vilnius. It was picked up by nearly fifty news outlets now and has garnered some interest. June 17, 2015A mosaic floor that appears to be from one of the earliest churches in the history of Christianity was uncovered recently in Nazareth, Israel, at the Church of the Annunciation (Greek Orthodox). Duquesne University’s Dr. Philip Reeder, dean of the Bayer School of Natural and Environmental Sciences, is a co-investigator on the project and is the chief cartographer for the research team that made the discovery. The church is seen by Christians worldwide as a shrine of great significance going back to the origins of what became Christianity. According to an ancient tradition, the Angel Gabriel “announced” the forthcoming birth of Jesus at a spring or well that Mary was visiting to get water. 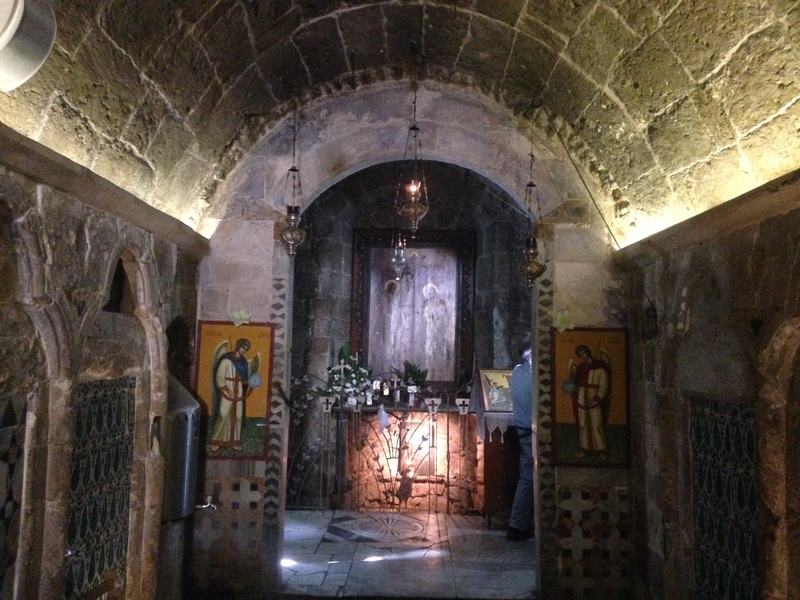 It became the place where the Greek Orthodox located their first Church of the Annunciation in the Byzantine period. Over the centuries, the church was destroyed multiple times and rebuilt in the pre-modern period. The mosaic floor is thought to have been created in the 4th century, when Queen Helena, mother of Constantine the Great, came to the Holy Land to establish Christian pilgrim sites for the new religion of Rome. “Based on the data we collected in December 2012 and January 2015 using the geophysical techniques ground-penetrating radar and electro-resistivity tomography, we determined that ‘something’ was buried beneath the courtyard behind the current incarnation of the church,” said Reeder, who created maps that depicted the location of the structural anomalies the team found approximately six feet below the surface. 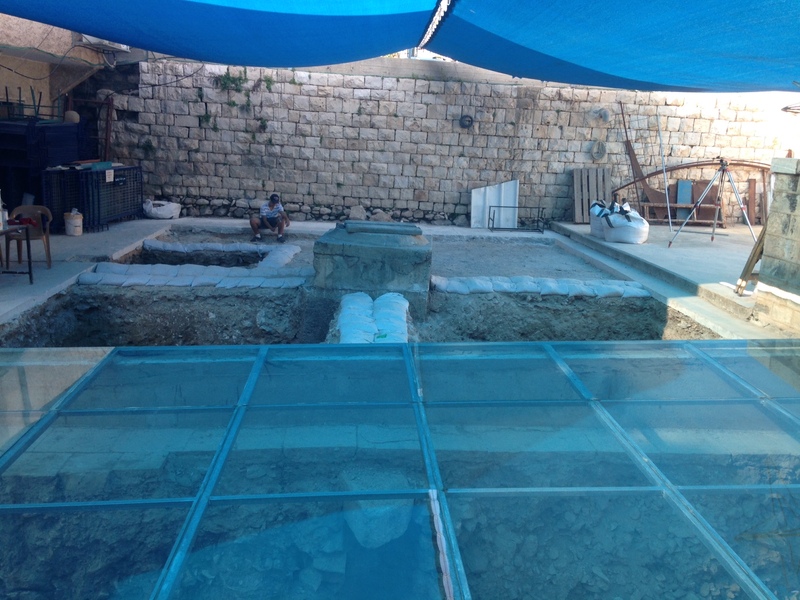 Based on this information, an excavation was licensed by the Israel Antiquities Authority, and approved by the Greek Orthodox Bishop of Nazareth and the Arab Orthodox Council. Excavation at the site on June 10confirmed that the feature found in the geophysical data was the mosaic floor. The excavation was led by University of Hartford Professors Richard Freund and Maha Darawsha, and Haifa University Professor Shalom Yanklovitz. Dr. Harry Jol from the University of Wisconsin-Eau Claire, geophysicist Paul Bauman from the energy and resources company Worley Parsons, and Reeder comprise the remainder of the research team. Darawsha, who was born near Nazareth and is credited with finding the magnificent mosaic floor during the excavation, delivered news of the find at a press conference on June 15 organized at the site by the Greek Orthodox Bishop of Nazareth. For their next project, some members of the research team will visit Vilnius, Lithuania, from June 20-July 1. Reeder again will be in charge of collecting spatial data and mapping in the search for the remains of The Great Synagogue of Vilnius, one of the oldest synagogues in Eastern Europe. He is capturing the trip in his blog, athttps://duquesnescience.wordpress.com. Founded in 1878, Duquesne is consistently ranked among the nation’s top Catholic research universities for its award-winning faculty and tradition of academic excellence. The University is nationally ranked by U.S. News and World Report and the Princeton Review for its rich academic programs in nine schools of study for nearly 10,000 graduate and undergraduate students, and by the Washington Monthly for service and contributing to students’ social mobility. Duquesne is a member of the U.S. President’s Higher Education Community Service Honor Roll with Distinction for its contributions to Pittsburgh and communities around the globe. The U.S. Environmental Protection Agency and the Princeton Review’s Guide to Green Colleges acknowledge Duquesne’s commitment to sustainability. Hello from Newark, NJ. I am in transit back to Pittsburgh. We departed Vilnius on Sunday June 28th. I must say the research went very well. We completed six GPR grids in all and I was able to complete a draft map of the synagogue area that begins to tie the geophysics data with some of the spatial data we collected. Over the next few weeks the data set will be refined and numerous maps and diagrams will be created. Jon Seligman from the Israel Antiquities Authority, who was the onsite director of the project, was very pleased with what we were able to accomplish. As the data analysis continues we will continue to refine our interpretations for the structures that are buried at the site. Travel plans collided directly with the completion of Grid six on Saturday June 27th, and the data is still being prepared for eventual analysis at Geo Slice in Los Angeles. The Israeli Antiquities Authority is preparing a press release related to the work at the Great Synagogue. Once that one comes out Duquesne and Hartford will have press releases as well. Travel on Sunday June 28th was rather eventful. Myself and Harry Jol were to fly to Vienna and then on to Brussels for two days of synagogue visits and touring. There are several synagogues in Brussels that date from the same period as the Great Synagogue in Vilnius. To see intact versions of similar structures is very important in terms of visualizing what is buried in Vilnius. We made it to Vienna, but the flight to Brussels was canceled. We were re-routed to Frankfort and then Brussels, arriving at the city center where we were staying at about 11 PM. The good thing was that all the equipment somehow made it to Brussels. We stored it at the airport so we did not have to haul several hundred pounds of gear around with us. The two days in Brussels were very helpful in terms of better visualizing the Great Synagogue. The beer was not bad either! Travel from Brussels back to the USA has been uneventful so far. The gear made it to Newark, it cleared customs and has been rechecked. My flight to Pittsburgh leaves in two hours. The news about the Nazareth research is that what we have completed thus far has made it into many press outlets based upon our news releases. Excavations ceased two weeks ago in observance of Ramadan. The plan was to begin excavating again next summer with a full crew of excavators and students, but the Greek Orthodox Council really wants to fast-track the excavation and complete it this summer! A plan is in the works to accomplish this. I have been invited to be part of the onsite team beginning August 4th, but at this point I do not know if that is possible given other commitments. I am writing this on Saturday early afternoon, June 27th. Over the past two days we continued data collection and analysis. As of 6 PM local time Friday (last night) we shut down data collection and have moved into the intense data analysis phase. I need to come clean that the phase of the project we are in for the next two days is a bit less intense. Because of the long days with over 16-hours of daylight given our latitude of nearly 55 degree north, we have regularly been putting in 14-hour days in the field. The data compilation phase we are in now is much less intense. 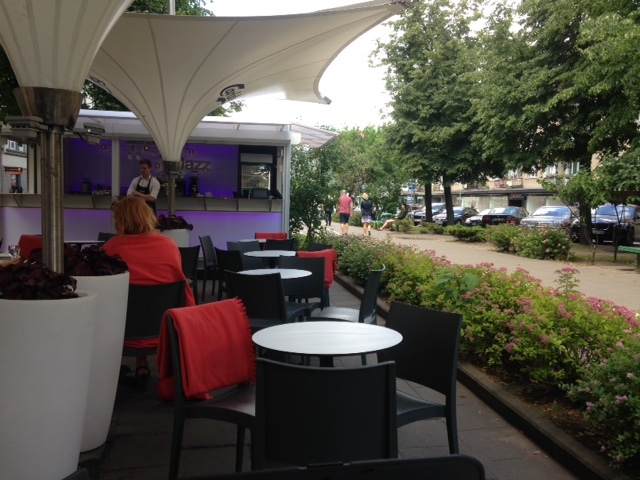 Along this lines I write this blog at a street side cafe consuming a fine beverage. The evidence is below. Now onto what we accomplished Thursday and Friday. I last blogged Thursday afternoon. On Thursday we continued to collect GPR data, as well as spatial data for the creation of maps and diagrams related to the research. It may be useful at this point to provide a rundown of what we have been doing in terms of geophysics and mapping. Today I will also provide an overview of some of the connections we have made in terms of future research and collaborations. Regarding the GPR data collection, six grids have been completed. Before I provide the review, I want to provide the newest version of the map because it presents the preliminary information for the location of the grids. Here is the newest version of the map. Again, this is just a “field” working version, that will be refined and will be one of many maps and diagrams created based on this body of research. This is the forth “field” version and I already have enough changes to complete a 5th version. When I return to Duquesne, over the coming weeks and months, I will create many more versions and numerous other map products. Now, here is the review of the grids. Grid #1 is on the south side of the contemporary school that is now on the Grand Synagogue site and it was deliberately located at a place where excavation took place in 2011. By strategically locating this grid it provides data for a location where we have a good idea of what is already located in the subsurface. In this way we can assess how well the equipment is working, and any limitations to data collection projected over the entire site. The equipment performed very well and we could see down to a depth of nearly three meters. What we could see on the plots created from the data is what we expected based on the 2011 excavation reports. Below is the GPR Slice plot. 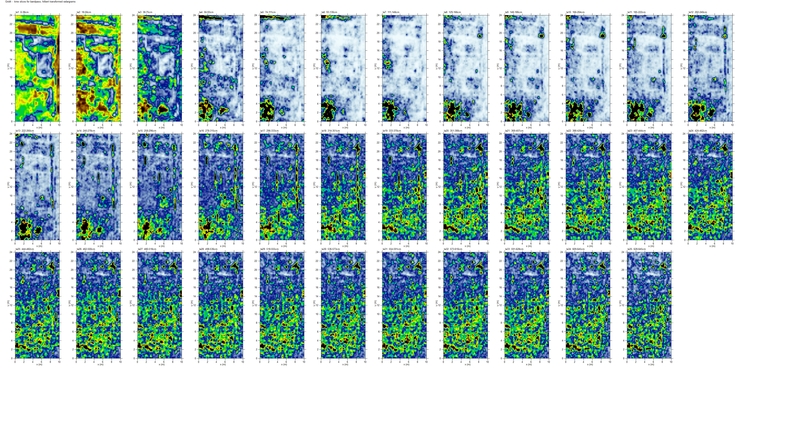 What is depicted are slices down through the data (top screen left) to the deepest penetration of the GPR signal (bottom screen right).In terms of depth in the lower right we can actually see to a depth of over four meters. The features at show up in the towards the bottom of the slice at the deeper depths are a set of steps entering the synagogue, that we excavated in 2011. Upon completion and analysis of the excavation, it was filled with sand with local soil then place at the top of the infill material. It appears that the GPR signal is able to pass to greater depths through the sand, compared to the native soil found at other grids in the study area. The data collected from grid #1 was invaluable in assessing instrument function. I discussed grid 2 a few days ago, but her is a brief restating of the importance of this grid. It clearly shows structure (interpreted to be walls) beneath the surface that are converging at right angles. These features definitely have the possibility of being buried walls left behind when the Soviets destroyed the synagogue in the 1950’s. The two slices that most clearly depict this feature are again presented below. Data for Grid 3, which is on the north side of the contemporary school is still being processed and I will discuss those when they are ready. Grid 4 and 5 have been processed and I will discuss the details of those grids and their significance now. The data for Grid 6, the final grid, is currently being processed by Geo-Slice in California. Below is the plot for grid 4. What is important about grid four (again keeping in mind it is located on the north side of the school) is in some respects what you do not see. Take note of the slices in the middle and bottom rows depicted above and notice the whitish streak across the slices. This is interpreted as the walkways that existed between the now destroyed synagogue buildings. There is no signal at these locations indicating structures of the debris from destroyed structures because they did not exist at the first place at these locations. Towards the bottom of the slices deeper below the land surface may be rubble from the destroyed synagogue buildings. The data from these areas will undergo a more detailed analysis to determine the more precise nature of the materials. What is interesting about the data from grid 5 are the features that are very consistent through the slices from near surface to depth. Also of interest are the areas that appear whitish that run the length of the slices in the top row of slices and through most of the middle row. This means that the feature (or as previously discussed the lack of any features) is consistent from near the surface to a depth of approximately 450 cm. Also of interest are the features that appears as the yellow and red anomalies both towards the top and bottom of the slices from near the surface to depth, which in this case is over six meters. Lastly, I want to discuss where we are with this project and where we go from here. The GPR data collection phase at the Great Synagogue site is complete. 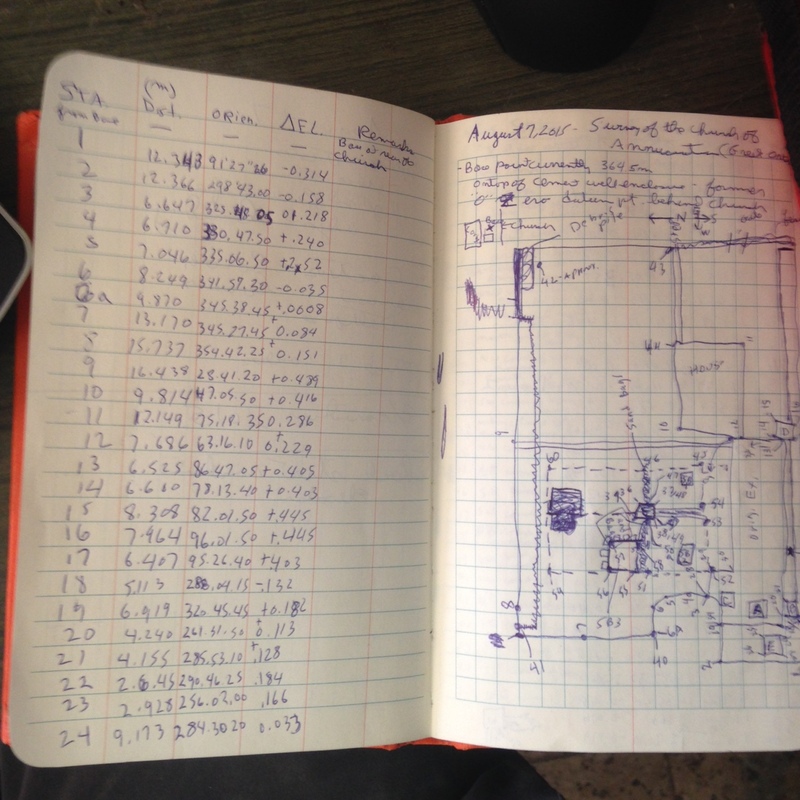 All of the data and interpretation, and any related maps and diagram I create, will be turned over to Jon Seligman from the Israel Antiquities Authority as he plans for future work at the site. His intention, as I understand it, is to do a full excavation at the site and to find funding to complete a full (or partial depending on the amount of funding) reconstruction of the synagogue. We will not be part of that project. Instead we will pursue other projects with local collaborators. Meetings have been occurring between our research group and officials from the Museum of Tolerance, and the local Jewish community regarding future projects. One will occur at the woods of Pannarai, which I have previously discussed. Another may be associated with the Jewish cemeteries that have been destroyed and in some cases fully or partially relocated during the Soviet period. These discussions are ongoing at this point to refine the details. Also, as previously discussed, I have set up, which at this point can be called an understanding, to work on a DNA project involving a Neolithic Archaeological site near Vilnius. More details about that project, and the relationship we establish between Duquesne, the Forensic Science and Law Program, and the Lithuanian researchers will be forthcoming. As will details about future possibilities for student and faculty exchange.